Here is one of the first examples I tried, taken from the 1981 high school sample exams. Consider the function f given by x -> x^2 / (x |x| + 1). On the TI-89, it is best to enter functions in the Y= window for easy reference later. The calculator also features pretty printing of the function after entering the raw definition, as shown below using the y1 slot. Now, the graph feature plots the function, nicely accounting for the asymptotes. One of the questions was to solve f(x) < 1/2 x. On the TI-89, this can be done with the solve function on the just entered y1 function. The solution is given on one line, so a bit of scrolling is required, but it is correct. Another question was to compute the area under the function on the interval [0,1]. This is easily done with the integral function, as shown below. 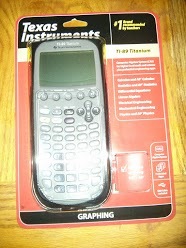 I treated myself with this Texas Instruments TI-89 Titanium calculator. I really like the computer algebra system and graphic capabilities. Although a bit retro compared with what one can do on a regular desktop, I was impressed to see this calculator solve all my high school advanced calculus questions symbolically by just pressing a few buttons. Group C in the ongoing 2013 chess tournament between UCI and XBoard engines for Android just completed a five seconds-per-move tournament played from both sides of all positions in the Silversuite gambit opening suite. Congratulations to Toga II for its promotion to Group B. Games available at the tournament site.